Fabric Legs and Borders are on almost every stage……. So what do they do exactly? While legs and borders can be manufactured without a lining, for maximum opacity and longevity of drapery it is recommended that they be lined. The lining will help to prevent any damage to the face fabric by set pieces that may come into contact with the back side of the drape. Additionally, a lining will slow the process of the fabric becoming brittle when exposed at close proximity to stage lights. Typical Fabric Choices for legs and borders include Cotton Velour and Encore Velour. For an economy masking drape with reasonable opacity consider 16oz Commando Cloth. Narrow and short legs look best with 100% fullness. A small leg (say 12’h x 4’w) with only 50% fullness will hang very “limp” or “thin”. When possible we recommend up to a 100% fullness construction for narrow stage drapery legs. When we talk about fullness, it is usually the result of a sewn in box pleat. Next in our “Meet the SW? Staff” blog series is one of the most unique, beloved, and integral employees we’ve ever been lucky to have. I am so excited for you to meet Burt the Bird, who was rescued a little over a year ago and has since changed the lives of everyone he meets for the better. Take a moment and read, in his own colorful words, the amazing journey that this sweet, talented, and I must admit, extremely confident little bird has taken to become one of the most popular employees here at Sew What? Inc., and you’ll soon realize that you have probably fallen in love with him, too! I was brought here to become the official Birdy Ambassador for all things drapery for the company last Spring, and have been hard at work ever since. I’ve been learning how to be a good bird, and have been teaching everyone I meet the importance of love, patience and care to ALL creatures, great and small. It’s a big responsibility, but one that I was born to do! Personally, I love it here in Southern California, it’s a bird’s dream come true! But if I were think exotically…. I really like fresh pineapple, strawberries, and melons, so it would have to be somewhere really tropical so I could eat it fresh right off the trees! I was just a wee baby bird of a maybe a week old when my mommy Megan Duckett (CEO and President of Sew What? Inc.) found me on Main Street in Downtown Los Angeles, right between 4th and 5th Streets. I had fallen out of my nest and could not possibly get back up there on my own, and this nice lady found me and immediately took me home with her to keep me safe, fatten me up, and spoil me rotten, just as all babies should be! So my job before coming to Sew What? was being a wild baby bird, and apparently I just wasn’t very good at it. I’d much rather be a “kept birdy” with my loving Sew What? family instead! I can devour any fruit you put in front of me in a mere few minutes flat (I’m talking HUGE strawberries, melons, blueberries, grapes, apples, and pretty much anything you give me! ), and since I’ve learned to clean my own beak on the sides of perch, I can clean myself up lickety split, too. My very special 1-year old “Burt-day” Party Bash, of course! My mommy got me a HUGE cake to share with everyone, and they sang (and some even whistled!) a wonderful happy birthday song just for me. I got fresh grapes, strawberries, and a new delicious seed stick that day, too. Just magical! I love watching online cat videos: the ones where the kitties jump up and miss the shelf and slide off to the ground, the ones where they get harassed by little humans, and of course the ones where my distant cousins the mockingbirds and crows chase them all around the yard, dive bombing them away from their nests. Hilarious! Those make me laugh and laugh. I like sitting out front of the office in the safety of my cage, eating my fresh fruit and seeds, swinging in the breeze, feel the Southern California sunshine on my feathers, and singing with some local buds I have in the area. I preen myself to look GOOD, and I also like to show that off as much as possible. I’ve been given many different types of seed sticks since being here at SW, but recently I was given the “mother” of ALL seed sticks. I had to approach it a little differently, come at it at a different angle, and pace myself so I wouldn’t become too exhausted (or too full). It was a truly challenging project, but when I finally finished it I knew that it was worth all the extra work and efforts. It’s always satisfying to finish a big project like that! I love that everyone here looks after me so nicely, especially my mommy and my “auntie” Kim Curran (Purchasing Manager). They make sure I’m warm, safe, well fed, and get lots of stimulating toys and activities. Everyone likes to come by and visit me, sing with me, whistle to me, and tell me what a good bird I am. I mean, I know that I’m a good bird, but it is always nice to hear it. Grand Drapes: What are they? How are they made? The front curtain – known also as the grand drape, act curtain or house curtain – hangs just upstage of the proscenium arch and is used to close the acting area from the audience’s view when the acting area is not supposed to be seen. The Grand Drape is typically part of the formal opening of a stage production – the house lights dim, the audience settles and the grand drape is removed from the scene revealing the stage and its contents behind. Interesting theatre fact: Historically, “grand drape” referred to the most downstage drape that would be raised to become the main teaser just downstage of the act curtain. Current theatre scenarios however have led to the main teaser being a permanently mounted valance, and the act curtain is now known as, and acts as, the grand drape. When planning your theatre drapery system, there are several types of front curtains to consider. The drape may part, rise, fold, drape or sink. The traveler curtain or draw curtain, is composed of two sections of curtain suspended from a traveler track, allowing the curtain to part in the middle and pull offstage into the wings. This type of grand drape is used when there is insufficient fly space to permit lifting the curtain, or when there is some design or visual value to having the drape move horizontally rather than vertically. Where the drapes meet in the center there must be an overlap of at least 12 inches to block any light leak. This curtain will always be sewn with fullness or pleating. There are many types of curtain tracks that can be used for this type of operation. Factors considered in the track selection will include weight of the drape, width of the drape and also whether it is curved or straight. The “tab” or tableau curtain is made in two halves much like the standard traveller curtain. However, by means of lines and rings sewn diagonally to the drapes on the back side, each half of the drape can be raised diagonally creating a draped opening. The shape of the draping and the width to which it opens revealing the stage is determined largely by the position and angle of the lines and rings. Learn More. The contour curtain is designed to be gathered vertically when raised by a counter weight system in order to expose, or close, the stage. This can create the effect of a fly curtain in a theatre where there is no fly space. Typically made of a light weight fabric with at least 200% fullness, each line of the contour curtain can be raised individually or simultaneously. When raised simultaneously the drape will lift and fall with the bottom edge parallel to the stage floor. When the lines are manipulated individually however arched openings of various shapes can be created. Contour curtain, also known as a waterfall or venetian. The Fly Curtain is used in large theatres where there is a fly system – a cavity above the stage with a mechanical system to raise and lower objects – and when the production design calls for a vertical reveal of the stage and its contents. Decorative fabrics are most often chosen and a lining fabric is usually sewn to the back to assist with the opacity of the drape. Fly curtains are sewn as one complete drape that is larger than the width and the height of the proscenium opening. It should, if counterweighted, weigh slightly more than its counterweight permitting a quick close of the fly curtain at the end of a scene. The bottom edge of the fly drape will rest of the stage deck (surface) so as to assure no light leaks from underneath. The brail and Austrian (aka puff curtain) are manufactured similarly to the contour but have only 25% – 50% fullness horizontally. While the brail has no vertical fullness the “puffs” or “smiles” of the Austrian curtain are created by adding 100% sewn in vertical fullness. These sewn scenarios require that the lines be raised simultaneously, and the drape will always lift and fall with the bottom edge parallel to the stage floor. While there is no right and no wrong fabric for a Grand Drape, typical fabric choices include 21oz or heavier Cotton Velour or 22oz Encore Velour. Those looking to create a premium drapery product with both light and audio blocking capabilities will want to line their grand drapes. The lining will add volume, so make sure that you are factoring in stacking and storage space for your new grand drapes. Track Recommendations for this type of application will vary depending on the style of drape chosen. Visit each drape style for track recommendations via the links above. 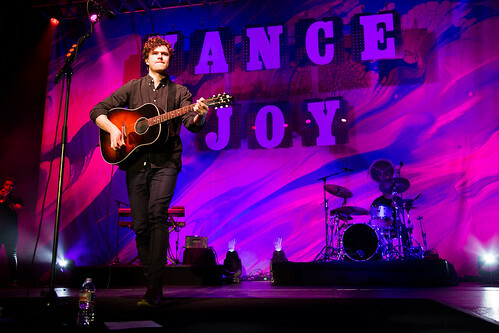 Recently we had the honor of being contacted by Mani Hammond, the Production Manager for Australian singer-songwriter Vance Joy. 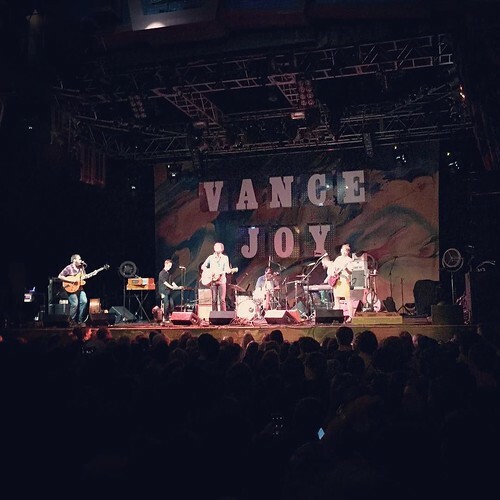 In preparation for a new world tour, they wanted to replace their current digital backdrop with a new one that could be used in a myriad of venues. They were looking for a 25’h x 45’w custom-built, digitally printed backdrop, but had some concerns about fabrics. The design team didn’t want anything too heavy, but they didn’t also want anything too sheer, and so we recommended FR Heavy Knit as the right combination of durability and print quality to meet their needs. This tour-friendly digital substrate is lightweight without being translucent, making it a popular and tour-friendly choice. The backdrop under “white” lighting showing the printed colors of the design. The letters hung in front of the backdrop were provided by the tour. We love it when our client’s design vision comes out so spot-on with that they were looking for, and this gorgeous backdrop absolutely brought “joy” to the entire staff while it was hanging in our warehouse, too!